This classic old school was a bit rusty. I started with Sun Tiger # 240 to create an edge, King # 1200 to smooth it up, Then, Shapton # 5000 for the first polish, scrubbed the surface with a rust eraser and finish with Shapton #12000. 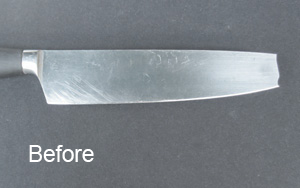 Now the knife is super sharp and clean as new. 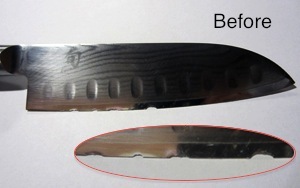 This Shun knife had massive chunks missing from the original blade. 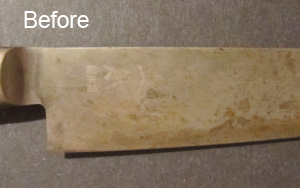 The owner was worried about the knife losing the original outline. 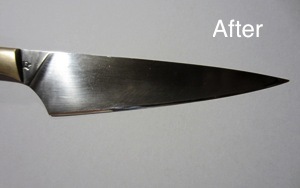 It was a very happy ending as the knife came back just a little smaller but kept the same shape and it was done for no extra charge. Watch out!!! I've got sharp teeth! This bread knife had no teeth at all when I received. 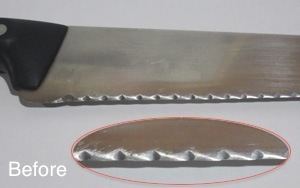 There are 2 options for fixing blunt bread knife. 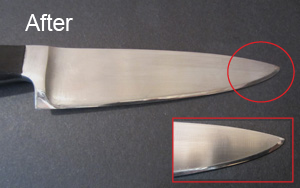 One is to take off the serrated edge and make a flat edge to use as a slicer. Two is to create new teeth to keep using as a bread knife. The new edge is super sharp and has no trouble slicing loaves of breads. Oops! 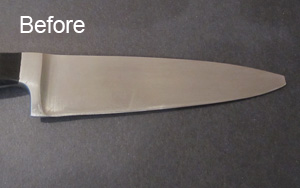 this chef knife was snapped from approx 1 / 4 from tip and the owner was about to throw it out. 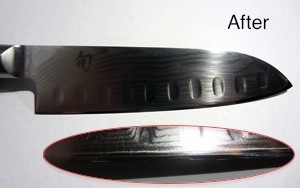 I ground off the back of the blade with Sun Tiger #120 to make it into Santoku shape then put a new edge with Sun Tiger #240 and moved up to King # 1200, Shapton #5000. then finished with Shapton #12000. Now the knife started its new life as a Santoku. 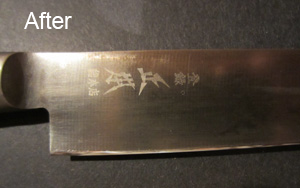 This Masamoto paring knife was very rusty as well as being blunt. 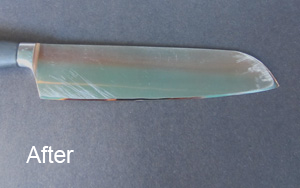 I started sharpening with Sun Tiger #240 to make a tapered edge then moved up to King #1200, Shapton #5000. 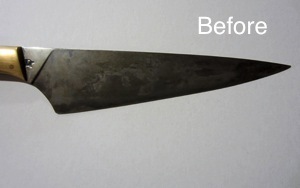 Before finishing, The blade was scrubbed with rust eraser to get rid of rust, then finished with Shapton #12000. The polished blade is incredibly beautiful. This is another repair work of snapped tip but this wasn't too bad. I created the new outline with Shapton #120. 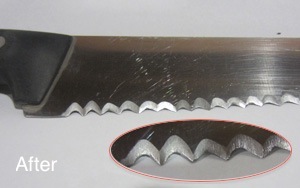 The typical humped heel of German knife was removed too to make the rocking action easier. The new edge was created with Sun Tiger #240 and moved up to King #1200, Shapton #5000. then finished with Shapton #12000. Now the pointy tip is back again with a sharp and balanced edge. 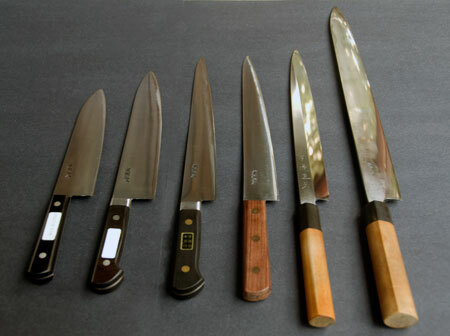 From left, Santoku, ( multi purpose ), Gyuto ( chef ), Sujihiki ( slicer ) two types, Yanagiba ( sashimi ) and Sakudori ( Tuna knife ).